You may have heard of K2 or “Spice,” a pair of terms for synthetic marijuana — or more appropriately, synthetic cannabinoids — which is growing in popularity. Some find them tempting substitutes for traditional weed because these drugs aren’t technically illegal in many places. People who undergo drug testing can consume synthetic marijuana because there’s no law saying you can’t — and that in turn makes the product cheaper and easier to get. Sounds like a sweet deal, right? The reality, though, is that synthetic cannabinoids are dangerous. Dozens of Spice users overdosed on the drug in New York City in 2016, resulting in “zombie”-like behavior — not to mention injuries and death. How could something so scary hit the streets in such a major way? To grasp the trend’s allure and danger, you need to understand synthetic cannabinoids. 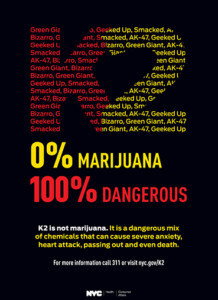 As the poster from the New York City Health Department above reads, K2 — or any form of synthetic weed — is not marijuana in any shape or form. These types of fake weed are actually dried plant matter that have been sprayed with a variety of lab-made chemicals. Identifying the specific chemicals present in K2 or Spice can be difficult because the term “synthetic cannabinoids” includes over 700 different chemicals, and the list varies from brand to brand. No forms of synthetic weed contain tetrahydrocannabinol, or THC, the mind-altering property found in marijuana. Why Are Synthetic Cannabinoids Dangerous? 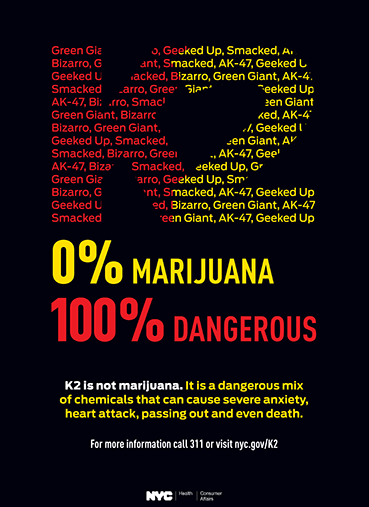 The chemicals found in the likes of K2 or Spice are not natural and can range in potency depending on the brand. This renders synthetic cannabinoids unpredictable and there are serious risks associated with their use. According to the New York City Health Department, the side effects of synthetic weed include extreme anxiety, confusion, paranoia, hallucinations, rapid heart rate, vomiting, seizures, fainting, kidney failure, reduced blood supply to the heart and, in serious cases, death. Unlike natural marijuana, K2 has directly resulted in the death of two people as well as over 6,000 synthetic cannabinoid-related emergency room visits since 2015 in New York City alone.